A hard dry sausage of Italian origin that is prepared by combining meat from the most marbled part of pork necks and shoulders with seasonings such as cayenne, black or chile peppers. Dry white wine is then repeatedly added over several weeks prior to drying the sausage. The ingredients are mixed, aged for several days, remixed with additional wine, aged again, remixed, and then aged for several weeks, after which a natural casing is added and the sausage is dried for 3 months or longer. 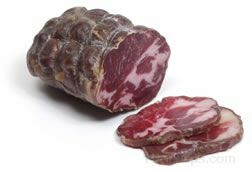 Coppa can be served as a main dish or as an appetizer and is an essential part of antipasto. The ham that is produced with the same meat from the hog is known as Capocollo.